MIST Ice Tea Jug for cold-brew 50 oz. 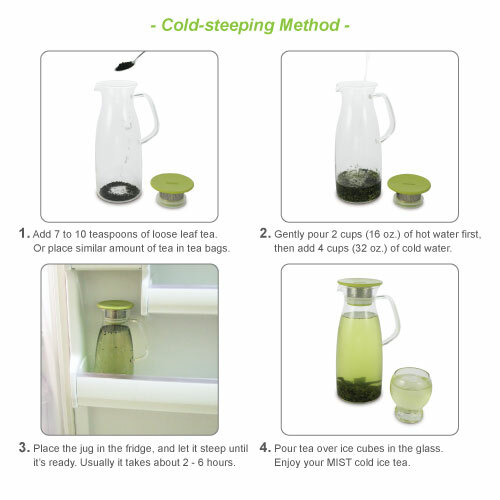 MIST Ice Tea Jug is designed for a simple way of making the cold-steeping ice tea. The double ring silicone gasket ensures lid from falling off when serving. The 0.5 mm hole stainless-steel filter catches tea leaves and gives you smooth pouring. The filter and silicone gasket are easy to take apart for cleaning. True borosilicate hand blown glass can take hot water to ice cold water. Dimensions: 5.75" wide with handle, 4.25" diameter base, 3.25" diameter top opening and 10.25" tall. The slow cold-water-steeping method extracts more natural sweetness and flavor from the tea leaf. It lessens the bitterness and tanginess produced by tannic acid so your tea taste smooth and mild. Just make tea and keep inside the fridge until itÕs ready. 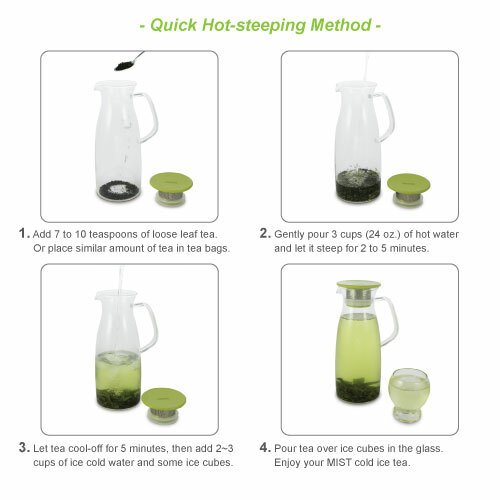 Or, try the quick hot-steeping method if you are in hurry. Enjoy your MIST cold ice tea. I have only used this for cold-steeping so far but it far exceeds my expectations. It is an easy way to use loose leaf tea to make tasty iced tea. It can be a little time consuming removing stuck leaves from the filter but even that shouldn't take more than a minute. It is worth every penny and more if you enjoy iced tea and are tired of being limited by what you can find in pre-made bags.